WWE has added another Women's Championship match to the Money in the Bank card. 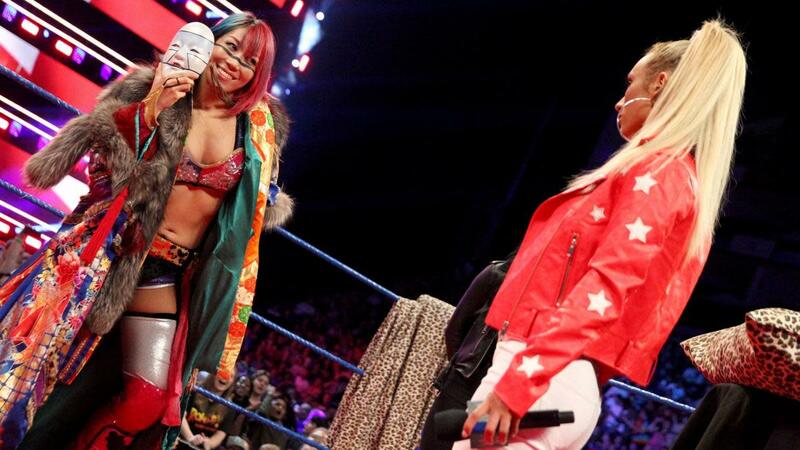 A day after Nia Jax vs. Ronda Rousey was announced, WWE revealed that Asuka will be challenging for Carmella's SmackDown Women's Championship at the pay-per-view. That was set up at tonight's SmackDown tapings in London, with Paige interrupting Carmella's "Royal Mellabration" and making the match. Carmella at first responded by saying she wasn't defending the title at Money in the Bank and then left the ring when Asuka came out. The only time Asuka has challenged for the title was at WrestleMania 34, where Charlotte Flair ended her undefeated streak. Carmella cashed in her Money in the Bank briefcase to win the championship on the SmackDown after WrestleMania and went on to successfully defend against Charlotte at Backlash.